In the USA, the BGO Records(UK) release of the 3rd in a series of reissues of my recordings that span the late '70s, the early '80s, and now the mid-'90s happened this past March 23rd, 2018. It is especially great because it follows on the heels of my most recent album, "BACKLOG"(Tone Center). This new reissue embraces what I would refer to as the Eyewitness2 period from "PUBLIC ACCESS"('89) with Dave Weckl on drums; to "HEADLINE"('92) and finally "CROSSINGS"('94) both featuring Dennis Chambers on drums. The music on all of these albums represented a deepening of our music-making concepts, and the further exploration of feeling the presence of essential Latin elements in the music. 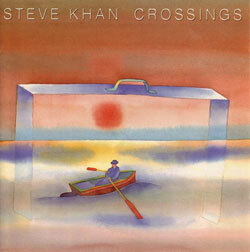 "CROSSINGS" was probably the first full representation of that kind of expression. Without question, the music most certainly had Latin influences and feels. With this reissue release now in its 3rd month, I wanted to take one last opportunity to help promote this compilation by presenting Michael Brecker's superb tenor saxophone solo over the great Bronislau Kaper-Gus Kahn tune, "While My Lady Sleeps." Saxophone enthusiasts all over the world associate the treatment of this enduring melody with John Coltrane and his 1957 version, which first appeared on his album simply titled, "COLTRANE"(Prestige). In his classic interpretation, 'Trane chose to play the tune as a kind of ballad with the [A] melody sections played over a haunting ostinato. In keeping with so much of the music on "CROSSINGS"(Verve), this piece was to receive a Latin treatment using what I later came to know as the Abakwa rhythm in 6/8 Afro-Cuban style. This concept is hardly my own, and I only knew of it because of the brilliant Clare Fischer arrangement of "The Breeze and I" from the Jazz Crusaders wonderful 1965 "CHILE CON SOUL"(Pacific Jazz) album. I practically wore out the LP during my college years. For that performance, Clare had drummer Stix Hooper playing the Abakwa rhythm isolated on his snare drum, instead of the more traditional approach with a percussionist playing a chekere! It becomes a fascinating rhythmic mystery with a sense of 4/4 wafting over and around the 6/8. 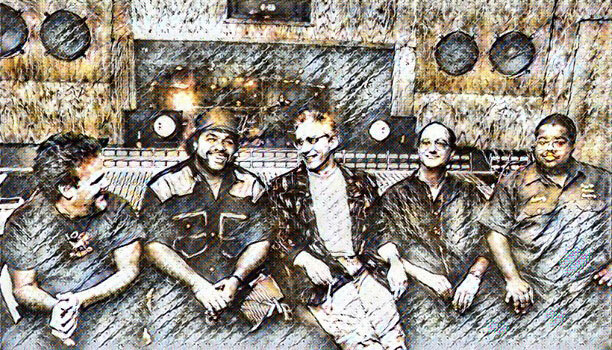 Showing how little I knew then in 1994 when we recorded our version, I had written out my arrangement in 3/4. This is something that no Latin musician would ever do. They would, no doubt, write it out in 6/8. The good news for me is that, when presenting Mike's solo, having it in 3/4 makes it far less cramped trying to fit all of those damn 16th-notes that he played, especially during the double-time passages! For our performance, I had Dennis Chambers(drums) do something similar on brushes, and Anthony Jackson(Contrabass Guitar), at least during the head, played a part with a similar quarter-note emphasis, and, of course, Manolo Badrena(percussion) played in all the right cracks as only he can. Like most tunes that become standards, they always seem to come from rather obscure films or Broadway musicals. 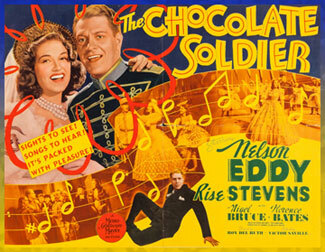 In truth, I had no idea that "While My Lady Sleeps" actually came from the 1941 film, "THE CHOCOLATE SOLDIER" and was originally sung by Nelson Eddy. Once again, writing an analysis has become an education for me as well. When you have a tune like this one, you only have to look at two of composer Bronislau Kaper's other oft-interpreted gems: "On Green Dolphin St" and "Invitation" plus the hauntingly beautiful and sentimental, "Hi-Lili, Hi-Lo" to know that you are going to be hearing rich harmonies and beautiful melodies. So there is a wealth of material to draw from for any arranger. In that regard, I am no different. I sought to capture all the beauty of this melody, and while doing that, create a rhythmic piece of music that pushes the limits of what the song once was, and brings it to a new and hopefully interesting place. I treated the melody sections by being relatively faithful to the composer's harmonies, but then, as I often do, I invented a series of extremely personal changes over which to solo, giving an elongated feeling to each sonority. The opening 16-bar vamp during [I] reveals the harmonic territory for the overall tune and the soloing as well. For what was once an [A]-[A2]-[B]-[A3] form for the solo becomes: [I2]-[C]-[C2]-[D]-[C3]-[I3]. from there, Mike and I restate the gorgeous bridge section before the guitar solo begins. What you should notice and hear in the chord changes that I chose to use for the [C] solo sections is that in 3/4, there are 2 bars of each chord change. But, remember this, 2 bars in 3/4 would really be the equivalent of 1 bar in 6/8. So it can appear that there is all this time and space there, but it is actually not really the case. As the group completes the [A3] melody, it leads Mike right up to a G-natural in the middle register, and it is that very same G-natural which has served as the top voice of the guitar's chordal theme for all of the [I] sections. Mike takes full advantage of this particular note, and turns it into a thematic device that will, in many ways, give a continuity to the entire solo. A solo that, to these ears, is full of romance, relaxed melodicism and, of course, passion and FIRE!!! When I was crafting this particular arrangement from the harmonic side of things, I wanted to have a series of chords that reflected Kaper's original changes, but would also contribute to a free-flowing set of improvised melodic ideas. So moving from Cmaj9/6 to Bb7(13), both with that G-natural on top, and then Cmaj9/6 to Abm7/Db, this would give the soloist enough variety while feeling the floating nature of the beautiful Afro-Cuban 6/8 rhythms, though written in 3/4. Over the Cmaj9/6, more than any particular modal approach in these sections, it seems that Mike is applying the E minor pentatonic [E,G, A, B, D]. Over the Bb7(13), though you don't see many notes, he would probably employ F Dorian [F, G, Ab, Bb, C, D, Eb]. Finally, in the Abm7/Db bars he is playing Ab Dorian [Ab, Bb, Cb, Db, Eb, F, Gb]. Putting to use thematic material from the melody, in bars 8-9, you can hear one such passage, notice the descent via a Db major triad (F-Db-Ab). The 2nd 8 bars of [I2] is no less wonderful in terms of its melodic flow and gracefulness. I especially love the line configuration in bars 15-16 over the Abm7/Db chord where you see a terrific usage of the modal language with a G-natural thrown-in as a chromatic lower neighbor to the root. As Mike arrives at letter [C] and this chorus truly begins, his sense of the lines, even over similar chords, begins to change. You will notice that now, over the Cmaj9/6 chords, he is playing more in a modal framework, here applying C Lydian [C, D, E, F#, G, A, B]. But when he plays over the Abmaj9/6, he is applying Ab Ionian, or the Ab major scale [Ab, Bb, C, Db, Eb, F, G], In bars 7-8 and 15-16 over the Bbm7 chord, he is drawing from Bb Dorian [Bb, C, Db, Eb, F, G, Ab]. Notice how, from the end of bar 7 through bar 8, he is using notes in intervals of 6ths that come from the V7 chord (Eb7), if you consider Bbm7 to be a iim7 chord. However, here he is using notes from the Eb 1/2-tone/whole-tone diminished scale [Eb, E, Gb, G, A, Bb, C, Db]. Its appearance gives the lines a jagged edge after the utter smoothness of the more scale/modal oriented lines. When [C2] arrives, Mike's emphasis switches to a D-natural instead of riding the G-natural as he had been doing. In a sense, for the 1st 8 bars of this section, the feeling resembles [I2] more than [C]. Though the sense of modal language returns over both Cmaj9/6 chords between bars 9-10 and 13-14, as he dances around either 4th, the natural(F) or the Lydian(F#) as neither appears. Beyond this, over the Bbm7 in bars 7-8 and the Abmaj9/6, you hear the beginings of the kind of chromaticism that will occupy so much of this solo as it develops. To make the solo changes a bit more interesting, I decided to use a ii-V of the bV substitute heading to Dm7 in letter [D]. If you look closely at bar 16 of the section, the Eb7 chord, and you spell Gb as F#, and you then see the notes as: B-G-F#-F-E-D, you could view this as if Mike was employing Em7 or E Dorian [E, F#, G, A, B, C#, D], which is like using the normal ii-V (Em7-A7) over the b5 sub. The bridge for "While My Lady Sleeps" at [D] begins with an elongated ii-V to C major. Over the Dm7 chord, one would expect to see the usage of notes from D Dorian [D, E, F, G, A, B, C], and in bars 1-2, you do see D-E-F-G. But, before the first consonant note of E-natural appeared, there was some clever chromaticism Eb-D-Db so that the end result is that that both E-natural and D-natural were surrounded by both of their chromatic lower neighbors (Eb) and (Db). This gives the line so much character, because Mike was outside of the expected tonality beginning on beat 1. On beat 2 of bar 2, you can see that Mike's line is ascending by using, in this case, Ab melodic minor [Ab, Bb, Cb, Db, Eb, F, G], which really has the same notes in it as G altered dominant [G, Ab, Bb, B, Db, D#, F], and this gives you all of the altered tones (b5, #5, b9, #9). In bar 4, he anticipates the coming Cmaj7 chord by already being in C Lydian. Notice the F# and B-natural as he hits bar 5 and descends via a D major triad [A-F#-D] finally landing on E-natural. In doing so, he has covered all of the beautiful color tones: A(6th)-F#(#4)-D(9th). The beauty of this approach seems obvious to me, but you will have to be the judge with your own sense of taste. After this cadence, Mike takes a nice long breath for 2 bars before an elongated iim7b5-V to E7(alt.) begins in bar 9. Vaulting into the first real double-time passage from a honk on his low A-natural, over the F#m7b5 chord, modally speaking, I would expect to see notes from A Dorian [A, B, C, D, E, F#, G], Mike begins by playing notes from a B7(V7) chord [B-A-F#-D#]. Eventually, with the appearance of G#, the chromatic lower neighbor to A-natural, we finally see him ascending through parts of A Dorian. As he hits the B7(alt. ), where you might expect to see B altered dominant [B, C, D, D#, F, G, A], Mike plays a B-natural, and then rapidly descends through a B augmented triad [B-G-D#-B] before taking a breath. The final 4 bars of the section, he is asked to negotiate a III7(alt.)-VI7-II7-V7(alt.) turnaround progression. Bars 13-14, E7(alt.) to A7(13), perhaps because of the meter and the tempo, he seems to ignore the E7(alt.) chord, and immediately begins passing through A7, passing down chromatically from A-natural to C#, and clearly stating two chord tones: C#-E-C#-E. Then, instead of playing through D7(9), he ascends through Dm7 and D Dorian for 2 beats before playing an Ab minor arpeggio anticipating the arrival of the G7(alt. ): Ab(b9)-Cb/B(3rd)-Eb/D#(#5)-Ab(b9). By the last note, that high Ab, he's up in the stratosphere of the tenor sax. [C3] presents itself as being a bit different than the prior [C] sections. You do have the first 16 bars with similar changes to play over until bar 15-16, where you have an A7(alt.) chord to lead you to an additional 8-bar section which I have labeled as a [Tag]. As Mike arrives at bar 1 of this section, he is still skyward in his upper register and is, once again, thematically centering the section around this high G-natural. As he has done previously, the consonant and very melodic notes are chosen from E minor pentatonic. Notice how, on the last beat of bar 2, he is anticipating the arrival of the Abmaj9/6 chord, and as the chord arrives, he still uses that high G-natural to tie the phrases together. In bars 5-6, you see the same approach as in bars 1-2. When the Bbm7 appears in bars 7-8, as G-natural is still in Bb Dorian, it is there as he descends using more modal chromaticism. That phrase begins a wonderful flow of 8th-notes, and this time over the Cmaj9/6 chord in bars 9-10, he is employing notes from the C Ionian mode/C major scale. This is because of the presence of an F-natural. However, over the Abmaj9/6 chord, he is now using Ab Lydian [Ab, Bb, C, D, Eb, F, G], with the presence of D-natural being key to this modality. One other small phrasing detail but so crucial to the language of Jazz is Mike's usage of the rhythmic groupings on beat 1 of bar 9 and beat 3 of bar 12. This kind of phrasing has been around forever but many people would associate with all the Charlie Parker heads and solos. Within them, this grouping appears virtually everywhere. If you are not using this phrasing technique much, learn it and start using it more often, it will improve the flavor of your improvisations. As Cmaj9/6 returns for bars 13-14, so does the C Lydian mode, again, pay attention to the F#'s in his symmetrical phrases. As bars 15-16 appear and A7(alt.) is the chord, I view Mike's line configuration as a chromatic descent with the 'real' 1st note being the G-natural on beat 2, and the Ab that precedes it is just a chromatic upper neighbor and we shouldn't be making any more of a big deal out of it than that! As his true target note is D-natural in the 1st bar of the little [Tag], the 6 8th-notes that come before it are fascinating. I see them as two groups 3, Eb-D-Db and E-natural-Eb-Db. To these ears, the 1st 3 notes are really to enhance the placement E-natural(5th), as it leads down through Eb-Db(C#) both chromatically surrounding the D-natural!!! The 8-bar [Tag] provides a romantic contrast, especially during bars 5-8. But, it begins with a ii-V7-III7-VI7 progression. Over the Dm7 you hear the first 4 notes as D Dorian, but then, Mike anticipates the arrival of the G7(alt.) chord in bar 2 by already playing in either Ab Dorian or Ab melodic minor, though you do not see a G-natural or Gb. However, all the alterations relative to G7 are present: Ab(b9)-Bb(#9)-Eb/D#(#5)-Db(b5). Over the E7(alt.) chord in bar 3, I still believe that the general thrust of what Mike is doing is to already be playing over the A7(alt.) chord. But, by playing Bb-Ab(G#) on beat 1, he has played the b5 and 3rd of E7 before descending chromatically down from A-natural on beat 2. The only chromatic note that he skips is Eb. At this point in our analysis, I want to share something with everyone that shows Michael Brecker to be just as human as the rest of us. I located his tenor sax, Bb part, for this tune, and in in bar 3 of the [Tag], where the band is playing E7(alt.) [which in Mike's tenor sax key is F#/Gb7(alt)], Mike had written a little crib note written for himself that the modal approach should come from Bb Lydian augmented. Lydian has always been Mike's modal orientation. For us, in concert key that would be G# Lydian augmented, or the way I view things, E altered dominant, or F melodic minor [F, G, Ab, Bb, C, D, E]. The point is this, at certain points in any and all tunes, all musicians make notes, little reminders to themselves, about the modal approach that they might want to take - especially with a tune that they might not have been playing all that often, or haven't played in years - or haven't played in a particular key. So, take heart all players young and old. In one small way, Mike is just like the rest of us!!! Returning to the solo, finally he lands on Bb over the Gbmaj9/6(#4) chord. After taking a breath through the rest of bar 1, and the 1st beat of bar 2 over Fmaj7(9), it seems that on beat 2, he begins to observe the prior Gb chord, except that he's playing Fb's, which are either the b7 of Gb or the maj7(E-natural) of F major. But to me, with the recurrence of all those Fb's and Db's, it seems to be far away from either Fmaj7 or the coming chord of D7(alt.). During bar 8 and the G7 chord, Mike plays completely consonant notes from G Mixolydian [G, A, B, C, D, E, F] or D Dorian. Without a single accidental, it is easy to see that he is also headed for the larger area of C major - where you have no sharps or flats. For Mike's solo, it is apparent that we must have decided that he would finish by playing over 2 16-bar sections of [I3], the latter containing a bit of a similarity to the last 8 bars of [C2] as it worked its way towards [B]. Over the Cmaj9/6 chord in bars 1-2, even in double-time, Mike is again putting the emotional emphasis on his high D-natural. Remember, in [C3] the emphasis was on his high G-natural, and this all compares to his approach to similar sections when the solo began. In bars 3-4, over the Bb7(13), that same high D-natural is there, and he descends through cascading intervals where a 4th, G down to D is present. During bars 5-8, some strange things begin to happen, and it seems that somehow, Mike's tenor sax part did not agree structurally with what Anthony and I had as indicated. I will try to explain as I go along. In bars 9-10, over the Cmaj9/6, everything seems to be in order, and that high D-natural has returned on beat 3 of bar 9. However, as Mike again cascades downward, where the chord for bars 11-12 is indicated as Abm7/Db, I see a C-natural, and that says to me that somehow, Mike thought that this chord was supposed to have been an Abmaj9/6 chord. During bars 9-12, there also seems to be some discrepancies. In bars 9-10, everything is in order over the Cmaj9/6 chord even though his brief phrase ends on an F-natural. It is as if he stopped himself. He then picks himself up in bar 10, and ascends towards what I had indicated as a Bb7(13) chord, but in bar 12, when Mike ascends, it would seem that the notes [Bb-G-Ab-Bb-Cb-Db-Eb-F-G-Ab] indicate that he was thinking that it was Ab melodic minor. A completely different sonority, unless he was implying Bb Phrygian over the Bb7(13) chord. In bars 13-14, Cmaj9/6 is again the chord, and all the notes make sense. As he ascends up the scale, there is another F-natural making this more C major than C Lydian. The last 2 bars, bars 15-16, were supposed to be Abm7/Db, in bar 15, with the presence of B-natural(Cb), he seems to be chromatically working around the indicated chord, but in bar 16, with the appearance of G-natural, F-natural, and E-natural, he seems to be anticipating heading back towards Cmaj9/6. The final 16-bar [I3] section arrives, and for a respite, Mike returns to a more melodic usage of 8th-note subdivisions. beginning on a D-natural and using syncopated rhythms he vaults up through the Bb7(13) chord to his highest G-natural and Bb, before eventually hitting the highest notes of this solo, a B-natural over the Cmaj9/6 in bar 5. As he descends toward the indicated Bbm7 chord in bars 7-8 of the section, he uses thematic material from Kaper's main melody: F-Db-Ab-F-G. It sounds beautiful where he has placed it. In bars 9-10, as Cmaj9/6 returns, so do the double-time lines. This time, as we see the presence of an F#, it appears that Mike is thinking C Lydian. On beat 2 of bar 10, he begins to anticipating the coming Bb7(13) chord, and on beat 3 you hear D-C-Ab-F, which is a clear indication, though very fast, that F Dorian is about to arrive. You see that through these 2 bars, and on beat 2 of bar 12, just as you saw it on beat 2 of bar 10, he plays the configuration of Eb-D-Db-F, but this time, on beat 3, it is followed by D-Db-C-E-natural, a clear indication that Cmaj9/6 is coming in the following bar. This time in bars 13-14, with the appearance of several F-naturals, he is putting to use C Ionian/C major. As this sonority extends for 4 full bars, in bar 15, he has vaulted up to his high D-natural(9th) again and falls to B-natural(maj7th), both beautiful color tones over C major7. The final phrase, leading us back to letter [B] and the bridge, slows down to 8th-notes with a beautiful little phrase whose notes indicate more to me of Ab melodic minor than either of the modal chord scales from A7(alt.) or Eb7 that would obviously lead to the Dm7 chord, the 1st chord of the bridge. But, Mike gets us there! 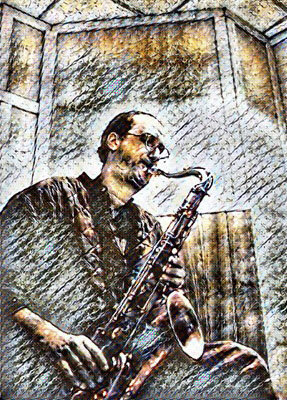 I know, I know, I am repeating myself, but.... What a wonderful solo ride this was by one of our greatest tenor sax voices ever, Michael Brecker!!! Bravo!!! Though this is not something that I usually do during the course of an analysis page, I did want to send out a most special and huge "Thank you!!!" to now syndicated DJ John Hill, who works out of Chicago's WFMT's Jazz Satellite Network. I have known about John since his days at WJZZ-FM in Detroit. One of my favorite stations to track during the run of any album release of mine if KCSM-FM which serves the greater San Francisco Bay area, where my dear sister, Laurie has lived since the late '60s, and this station picks-up John's syndicated broadcasts during their overnight hours. Over the past 2+ years, John Hill has presented "While My Lady Sleeps" some 7 times during those hours. That number might not seem like much to some of you, but to me? This is a lot of spins and I am so very grateful for that. So while writing this piece on the song and Michael Brecker's solo and performance, John Hill's name comes to mind right away. To me, he has been a great champion, a keeper of the flame for "CROSSINGS" and many of my other older recordings. Again, I am just so grateful for his support, and that of his broadcast mate, Neil Tesser. At this stage of my life, I am most appreciative of any and all airplay that my recordings receive. And, as none of them are serviced with the BGO reissue, anyone playing tracks from these 3 recordings is going to be aces with me!!! So, John Hill, I salute you!!! It wasn't so long ago that John Kelman wrote a wonderful piece, Eyewitness Remembered, for AllAboutJazz.com, and that very same piece served as an inspiration to float the idea of an Eyewitness reissue to BGO Records. Now, here we are, a couple of years later, and now, an Eyewitness2 reissue has been officially released. Now, Mr. Kelman has written yet another brilliant Review of this new package. We hope that everyone will take a moment to read what he had to say about these recordings and the players. 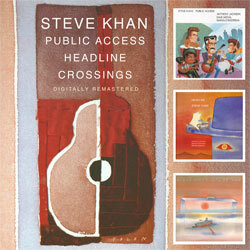 "If The Eyewitness Trilogy introduced a group whose concept was innovative at the time and remains so today, the essential PUBLIC ACCESS-HEADLINE-CROSSINGS takes it more than a few steps further, both in its move from original material to imaginative interpretations, and in acting as a bridge between the guitarist's earlier recordings and later, even more decidedly Latin-oriented albums. Eyewitness is often lauded for its unique (especially for its time) language and approach, deeply felt grooves and stellar playing. Still, the group's telepathic ability to engage with one another on a profound level must not be overlooked, its intrinsic conversational ability a definitive one, whether on a buoyantly Latin-zed version of Monk's "Think of One," an even brighter "While My Lady Sleeps," or a deeply beautiful, balladic look at Lee Morgan's "Melancholee," all from Crossings." I am so very grateful to Mr. Kelman, because reissues get such little attention from the press, and are never serviced to radio around the USA, so a review like this means more than most people can imagine. As I had stated when closing the analysis to his "Descarga Khanalonious" solo, I wanted the "While My Lady Sleeps" transcription to further celebrate the life and the exceptional musical legacy of Michael Brecker yet again. All that he is and was is never to be forgotten, but revered and treasured for all times. It is now June 1st, and for me, hopefully there are better days ahead looking down the road. The turbulence and uncertainty of 2017, and the most difficult beginning to 2018 have been cause for great reflection, self-examination and putting things in their rightful place - hopefully never to be revisited again. In the final analysis, one must take what has been learned, and put it to good use for a better future. This continues to be my fervent hope. Wishing everyone who regularly visits these pages a summer that is filled with memorable moments and a second half to the year that is far better than what had experienced thus far.